I used a mandoline for this fresh clean salad. If you don’t have one, take your time and slice your ingredients thin. Slice Pear and arrange on the bottom of your serving plate. In a small bowl place sliced cucumber and fennel Add salt and pepper. Add 2 tablespoons dressing and toss. Place mixture over pears. Sprinkle with apricots. Macerate together with a wooden spoon. Add remaining vinegar, a pinch of sea salt , a few twists of Black Pepper and a pinch of white pepper. Squeeze ¼ Meyer Lemon and zest. Mix together. 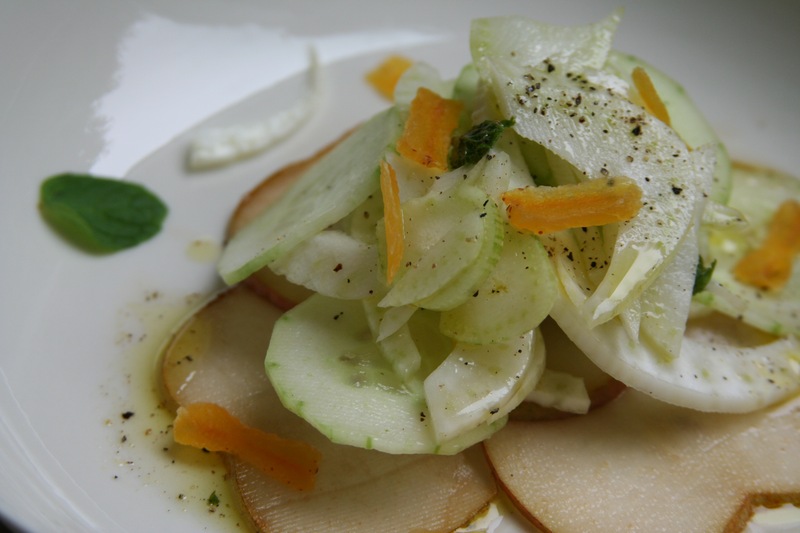 This entry was posted on Monday, April 22nd, 2013 at 11:57 pm	and tagged with apple cider vinaigrette, fennel, fresh, pear, salad and posted in Category. You can follow any responses to this entry through the RSS 2.0 feed.